The ‘Great Replacement’ may be decried by liberals as a ‘conspiracy theory’, but a new study of the latest figures from the UK’s Office for National Statistics shows that it’s an all too real FACT nevertheless. 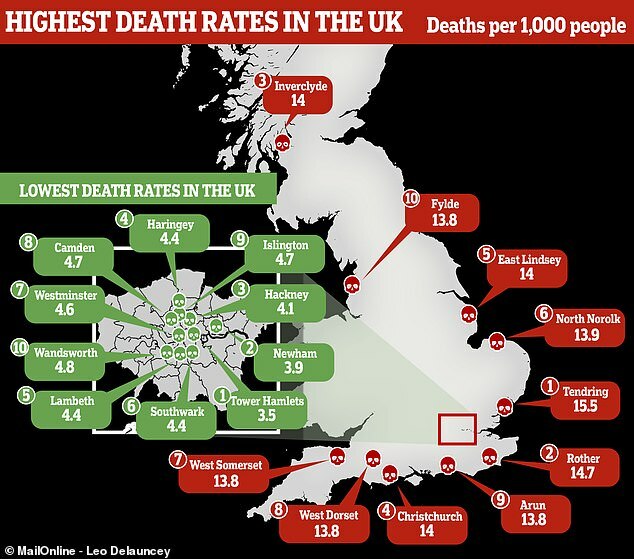 MailOnline sifted through the Office for National Statistics data to reveal the areas with the highest death rates. The result is crystal clear confirmation of our analysis and repeated warnings about the rapid replacement of elderly, childless or single child family indigenous Brits by the UK’s young and fast-breeding immigrant population. The Mail report names the 10 areas of the UK where the most people died last year, as well as the 10 areas with the lowest death rate. Tendring in Essex tops the char for deaths, with the official figures revealing 15.5 people died per 1,000 people last year. In comparison, the death rate in Tower Hamlets is nearly five times lower, with the London borough’s being just 3.5 per 1,000 people. The ONS figures, released today, revealed there were more than 607,000 deaths recorded across the UK in 2017. Statisticians broke down figures from all of the 423 local authorities to calculate a crude death rate per 1,000 people. This shows how many people die across each area, taking into account that some places have greater populations than others. The different death rates have very little to do with health service provision, lifestyles and so on. The overwhelming cause is that some areas have much higher percentages of older or younger people. As the Mail’s map shows, the high death rate areas are without exception in parts of the country with virtually no non-white immigration. The ten lowest death rate areas, i.e. the ones with the youngest populations, are by contrast all in inner London. That’s the part of Britain where the ‘Great Replacement’ is the furthest advanced. What’s more, in those areas, the majority of deaths will of course still be among the elderly, who even there are still largely the last remnants of the old British working class population who dominated those parts of London until the 1960s. What the Mail study therefore reveals is not some unexplained ‘shame’ of certain areas, but simply the fact that the native British population is imploding even as the migrant-descended population explodes. Looking at many British cities, the ‘Great Replacement’ appears to have happened already, but in fact it is still only just beginning. In the next twenty to thirty years the inevitable disappearance of the baby boomers will cause a totally unavoidable collapse of the native population and its influence, while the fast breeding and relatively large families of the African and Asian population of London and other ‘enriched’ urban areas will see the number and influence of the newcomers rocket. Brexit or no Brexit, immigration controls or open doors, nothing on Earth can stop this massive demographic shift – which is already under way. If you think this has all happened by accident, we suggest you take a longer, more realistic look at how it has happened and at the several different vested interest groups that encouraged and applaud it. But, to a degree, blame is now irrelevant. What really matters is the future.The native British are going to become a minority in their own homeland. That does not mean they will vanish, indeed, they will become the largest minority in a geographical collection of minorities. The sooner they understand what this means, and begin to think, plan and organise as such, the better it will be for all those living in the islands once known as the British Isles. Previous articleFalse Ecumenism continues: The Virgin and Buddha venerated at the SAME time!